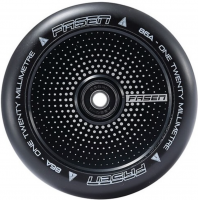 A selection of scooter wheels from Blazer, Blunt, ChilliPro, Crisp, District, Eagle Supply, Elite, Fasen, Grit, Lucky, Madd, Proto, River Wheel Co, Root Industries, Sacrifice and Tilt. 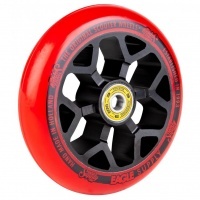 We supply wheels in varying sizes from plastic core 100mm to metal core 120mm. 110mm is the standard fit for most scooters so check that what you are buying will fit your scooter. 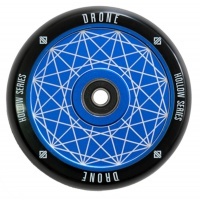 The Lucky Lunar 110mm hollow core pro scooter wheel is the newest and lightest wheel in the Lucky wheel quiver. 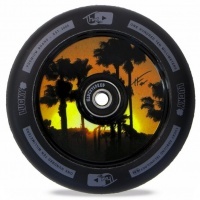 Finally the signature series wheel that all of us have been waiting for from Tanner Fox! 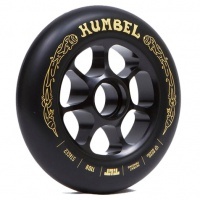 Featuring a hollow core construction, one awesome graphic and a black polyurethane outer! 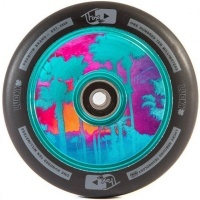 Standard on the new VX8 Pro Scooters and featuring the all new PU Pouring process. 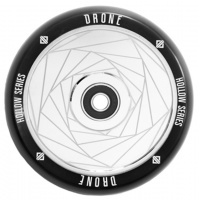 The Corrupt wheel is a brilliant, affordable route into the hollow wheels. 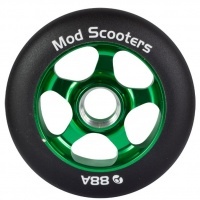 Standard on the MGP VX8 Team Edition Scooter, the MFX 120mm Fuse Core wheels have a 5 spoke design. 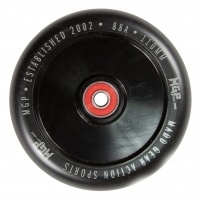 featuring the MGP urethane compound for a smooth, fast ride. 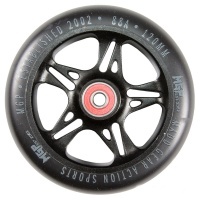 The 120mm Syndicate wheel is the same as what comes standard on the MGP VX8 Extreme scooters. 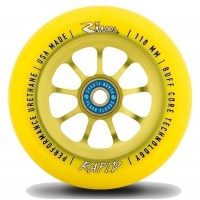 Available in a variation of colours these wheels are ready to roll. 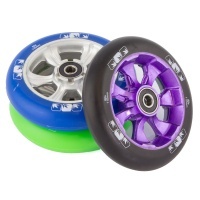 Tough Standard Plastic Core wheels from MADD. 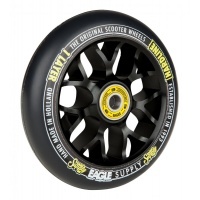 Standard on the MGP Pro Scooter and great value 100mm wheels that fit almost all scooters. Sold each without bearings. 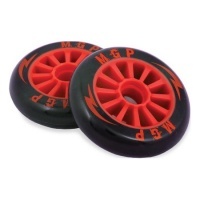 The red and black standard sturdy original MGP Pro Wheels are standard on the mgp starter scooters and are great strength to weight and super good price. Sold each without bearings. 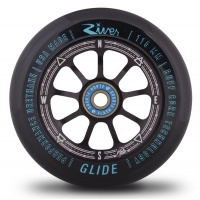 These River Glide wheels are 110mm in diameter. 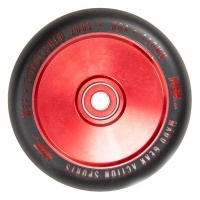 Red PU on a Red Core with some incredible laser engraved detailing. 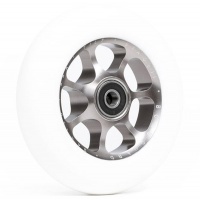 This is one of the best wheels though the doors. 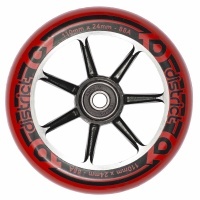 Currently one of the lightest scooter wheels on the market, and in our opinion, the Air wheels best looking range as far as scooter wheels go. 110mm gives extra roll. 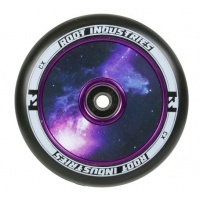 Weighing in at 190 grams the Root Industries Galaxy wheel is one of the lightest in the scooter world while also not compromising durability and strength. 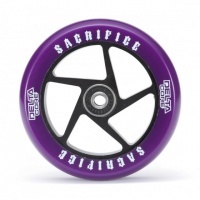 The Sacrifice Delta Core wheel is the same epic core as on the legendary Flight range of scooters. Tested for years with great results. 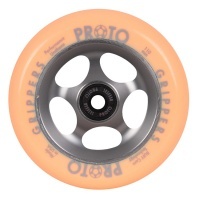 The Slamm Ny-Core scooter wheels are a 100mm plastic wheel wrapped in 88a urethane and pre fitted with Abec7 bearings so you can just pop them on your scooter and ride. Sold Each. 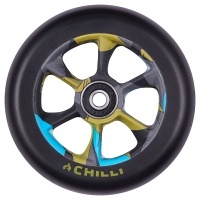 You wouldn't eat a cake without icing, so why would you think twice about finishing of your new scooter without a set of these Stage 2 Wheels. 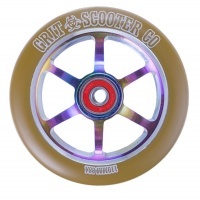 This rider approved Full Core Scooter Wheel is made in collaboration with Auzzie Crew, Friendly. One of the best brands in street in collab with one of the best in film. This 100mm wheel is perfect for smaller scooters that will not fit the larger sizes. 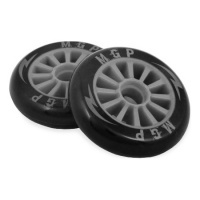 These wheels are super durable and look great in the black with faded white PU. 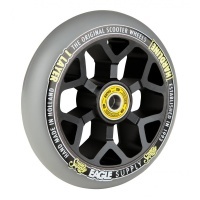 Eagle Hardline One Layer wheels are specifically designed for freestyle scooting. 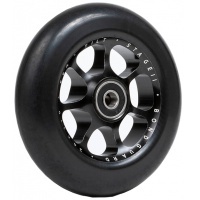 With balanced specifications this wheel brings maximum benefits to any style of rider. Sold Each. 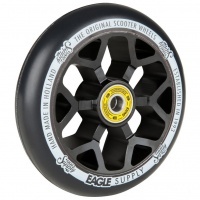 Eagle Supply Co. new standard scooter wheel in Black. Designed using 20yrs experience. Made from machine shaped 6061 aluminium and hand poured urethane. 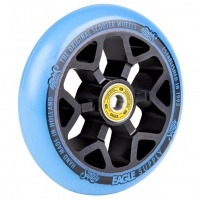 Eagle Supply Co. new standard scooter wheel in Blue. Designed using 20yrs experience. 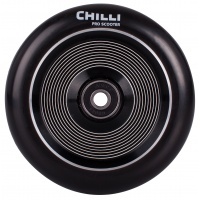 Made from machine shaped 6061 aluminium and hand poured urethane. 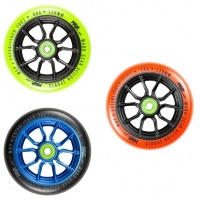 The hypo Pro Stunt Scooter Wheel range from Fasen are an incredible design. 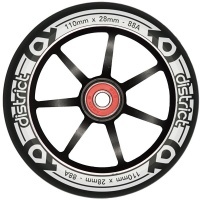 At 120mm these wheels are fast, and will see you through the park or streets with style and control. 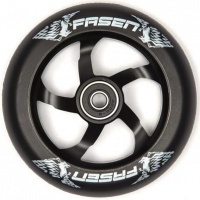 The awesome new 100mm wheels from the Fasen Raven complete scooter. The Black PU with Black spoked core are super stealthy and great on any custom scooter! Sold Each. 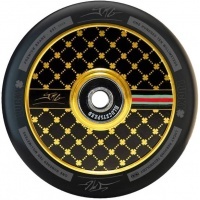 The 2nd edition of the Jon Marco Gaydos signature wheel is ready for your stunt scooter with tonnes of bling and style. 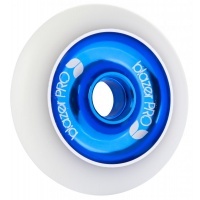 This new Hollow Core wheel is a real head turner. Made from 6061 aircraft aluminum and some sick colours. 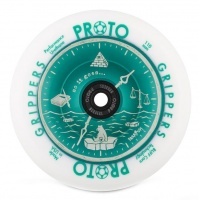 We finish the wheel up by laying down the best urethane in the industry, finished with Lucky Speedroll bearings for a smooth roll. 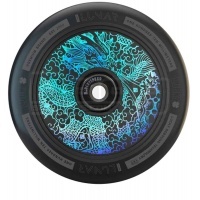 Finally the signature wheel that all of us have been waiting for, the Tanner Fox V3. 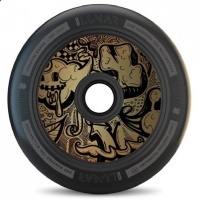 Featuring a hollow core construction, one awesome graphic and a black polyurethane outer! Stay as Lucky as Lucky can provide! 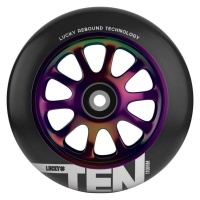 The Lucky Tens, 110mm Neochrome on Black wheels are used by some of the best riders the world. Super strong, super smooth and of course super light! 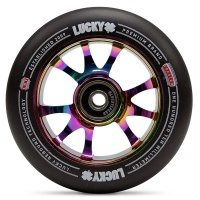 A long awaited and new addition to the Lucky Wheel Range. 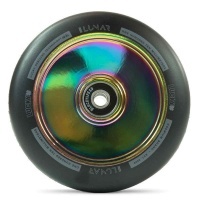 The toaster wheel has gone through a whole new process to bring a smooth, buttery roll. 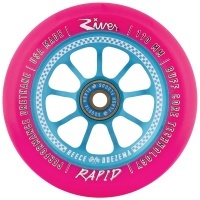 The River Wheel Rapids in pink PU on blue Spoked core are a strong, responsive and durable wheel perfect for street riding. 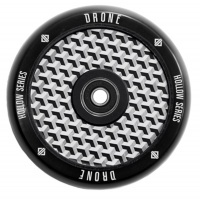 Including bearings and made in USA. 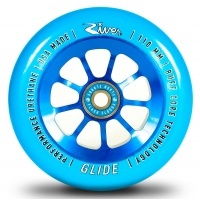 The River Wheels Glide in Blue PU with Blue core are smooth fast and and flowy, perfect for hitting up the park. 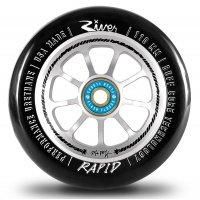 Sold each wheel including River bearings fitted made in USA. 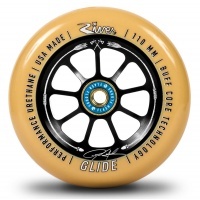 The Ryan Gould-Savage River Wheels Glide in Gum PU with Black core match his riding smooth fast and and flowy. 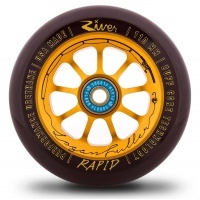 Sold each wheel including River bearings fitted made in USA. 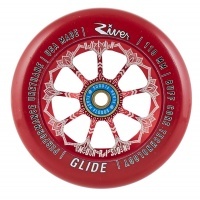 These River Glide wheels are 110mm in diameter. 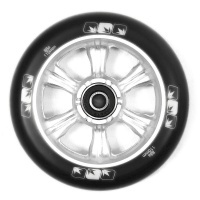 Black PU on Black Alloy gives this wheel a murdered out look. Blue detailing alongside blue flash flood bearings. 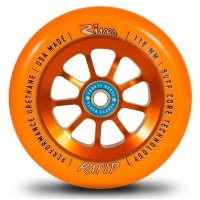 The River Wheel Rapids in Orange PU on Orange Spoked core are strong responsive and durable wheel perfect for street riding. 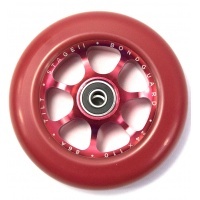 Sold each wheel including bearings, made in USA. 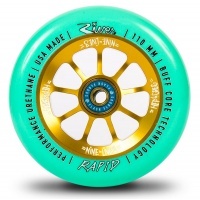 The River Wheels Rapids Greg Cohen Signature wheel is an awesome street wheel, hard and durable in fresh Mint pu on Gold core. 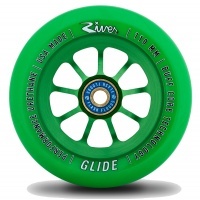 Sold each wheel including bearings, made in USA. 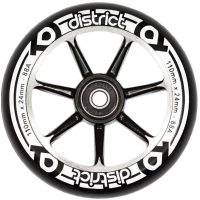 The River Wheels Rapids Matt McKeen Signature wheel is an awesome street wheel, hard and durable in classic black pu on silver core. 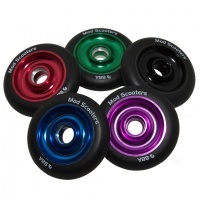 Sold each wheel including bearings, made in USA. 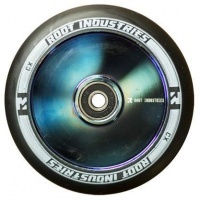 The Air Wheel from Root Industries in Black on Blue Ray is one of the lightest wheels on the market today coming in 110mm to fit almost any scooter deck. 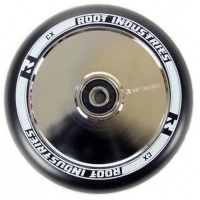 The Air Wheel from Root Industries in Mirror on Black is one of the lightest wheels on the market today coming in 110mm to fit almost any scooter deck. 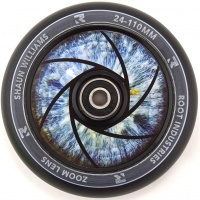 Very Exciting here, the 120mm Air wheel Honeycore Black Mirror by Root industries, extremely lightweight, strong, durable, and good looking. 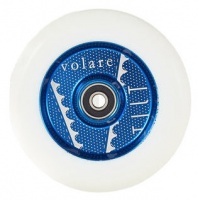 Tilt have joined up with the Volare Crew to produce these sick new wheels. They don't only look stunning, but performance is 10.